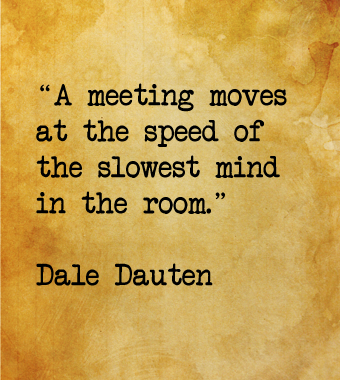 Worskshop-style meetings allow you to work together to improve every aspect of your company using workshop training. As you are improving all your impact areas, document everything as you go along. You will be creating a training manual for future hires as you create company policies that everyone will be trained to follow. 1. Schedule weekly meetings with your staff for the next year and put them on the company calendar. These are required meetings. 3. Provide your team with an outline of items to be covered at the workshop, so that your team members come prepared to train and contribute. 4. As the workshops are creating procedures and policies to solve problems, the leader of the workshop puts out a post-workshop memo stating the problem that was solved and what to do. That memo goes into a binder which becomes a Training Manual. As you test and finalize procedures replace the old memo. Assign someone the responsibility of updating the binder. 5. Make everyone a contributor to the meetings, to develop ownership of the success of training and productivity in the company. 2. Hold a workshop to generate solutions. 3. Develop a conceptual solution or procedure. Every solution or procedure is conceptual until it is proven by you or your staff. Test for any area for which you don’t have a procedure. 4. The leadership and/or top talent will personally perform conceptual procedures or tasks. Figure out who is going to champion a new idea. Have your top producers test and perfect procedures and then have them train the rest. 5. Set a deadline for testing the conceptual procedure. If you aren’t seeing results by the deadline, go back to the drawing board to look at additional options. 6. Document step-by-step procedure or process. You want this to be a repeatable process, so spell it out – your scripts, procedures, activities, and the results you expect to achieve. 7. Conduct show-and-tell and role playing sessions. Take your documented steps and work with your staff to test and implement them. Show-and-tell and role playing offer the best methods of gaining experience before you put the process into the field. 8. Follow up with another workshop focused on how to improve the process or task. 9. Monitor the procedure directly. Record the reps, and correct and monitor weekly until perfected. No matter how well you spell it out, some people will still miss some things. Once you’ve implemented, monitor randomly to make sure that the idea is being properly implemented and taught, and so on. 10. Measure and reward the outcome. You must measure your results intently. People respect what you inspect. Reward increasing performance and make a big deal out of it.